This the in between time in Michigan, the salmon runs are done, and the grouse and woodcock season is on the wane. It's too chilly for a day at the beach, so it's a good time to wander around Northern Michigan, just checking things out. On a recent Sunday, my son and I drove around Manistee County, where he lives, and checked out some trout streams for next spring, and look at some good grouse cover. It was a "pretty day," as my father from Arkansas would say, sunny skies and temps in the 60s. A gift from God in Novemember. 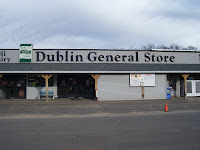 We made a stop in the town of Dublin, near Wellston, and visited the Dublin Country Store, which my son said had a large selection of jerky. Being a fan of the stuff, I couldn't resist the stop. I expected a small jerky shop, but instead stumbled into a classic country store, something out of the 19 century, but with 21st century goods. There was everything from clothing, to food stuffs, hardware, shotguns and rifles, ammunition and even plumbing and heating fixtures. There's also a bakery and a deli. The store also sells alcohol. If you're a rustic person, like me, there was pretty much anything you needed. 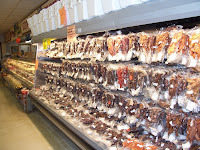 And of course, there was jerky, all kinds, from wildgame like elk and venison to beef, chicken and turkey. We tried the tradtional venion. It was great. I like the softer version of jerky, having tired of trying to chew on the dry stuff and challenging my teeth. And that's what the Dublin store offers. It would be a great stop during rifle deer season. Locations: The main store is on Hoxeyville Road near the town of Wellston. The store has another site in the Grand Rapids area at 4763 Wilson, Grandville, MI.